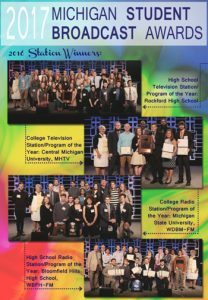 Michigan Student Broadcast Awards Deadline is Next Week! There’s just over one week left for your students to submit their work to be judged in the Michigan Student Broadcast Awards. Spread the word! The Michigan Student Broadcast Awards aid MABF’s efforts to further develop the education and experiences of Michigan students interested in the broadcast and media industry. This awards program specifically recognizes the outstanding broadcasting work done by Michigan students in 2016. Whether it’s a Current Events Program to showcase the 2016 Summer Olympics, a Hard News Story that covers a significant event in the community, or a Public Service Announcement of general public interest, the entries received represent the absolute finest student work throughout the state. These students, and the programs they represent, are working hard to someday reinvent the broadcasting industry. The entry deadline is quickly approaching! Make sure to review the online entry portal ASAP so you, or your students, have time to ask us any questions you have! Tell every student in Michigan that they are eligible to enter the competition for FREE with an opportunity to showcase their best work to broadcast professionals (who can actually hire them!) and compete with other Michigan student broadcasters! Students do NOT need to be enrolled in a high school or college broadcast curriculum to enter, they only need an advisor to sign their application form. The Student Broadcast Awards Ceremony will take place during the Great Lakes Broadcasting Conference (GLBC) Student Luncheon in Lansing at the Lansing Center on Wednesday, March 8, 2017. This Main Luncheon will include the awards presentations and scholarship presentations and is attended by broadcast professionals, students and guests. The popular GLBC Career Fair will immediately follow the luncheon, which will also include an area for students to network and mingle. Previous PostAssociate Member Highlight: Maner CosterisanNext PostGather your Broadcast Excellence Award Entries and Join the Party!